With LogDepot and Connected Views, Arbor Media provides a suite of products that covers the above applications in one efficient system. LogDepot is the well known capturing system, responsible for recording and live streaming audio and video inputs. Connected Views is the online portal creating a very accessible entry to Live Streams and archived debates including relevant metadata (speaker names, agenda items, meeting titles, voting results and more). 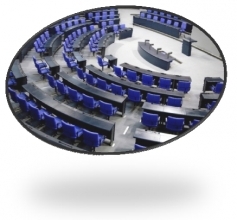 Many national and international Parliaments have experienced the benefits of our user friendly solution. Modern, professional, efficient and scalable from small regional parliaments to big international parliaments. Full integration with well-known conference systems (Televic Conference, Taiden, Bosch DCN, DIS) allow efficient and robust operation. Efficiently dealing with multi-lingual recordings from interpreter booths is a standard feature on our systems.